Technomad Associates, LLC, a leader in weatherproof loudspeakers and audio systems since 1995, introduces the Schedulon™, a new automatic mp3 player and recording system designed for integration into commercial security systems for airports and transportation centers of any size.Unique to the commercial market for its flexible scheduling and recording features, the Schedulon is a sibling of Technomad’s popular SuperConductor™ player/recorder used in military and homeland security applications. The Schedulon provides instant playback of up to 99 knob-assigned, user-loaded audio files from a front-panel screen, and allows automatic playback on a user-defined schedule based on an internal clock or synchronized network time server.Operators can interrupt automatic messages and play a knob-assigned siren or emergency announcement from an internal sound library in critical situations.The Schedulon is a reliable, standalone system with few moving parts and Flash RAM storage, and no computer is required for automatic playback.A hardware-based embedded system, the Schedulon does not use Windows or Linux “under the hood” and is therefore not susceptible to typical PC security risks. 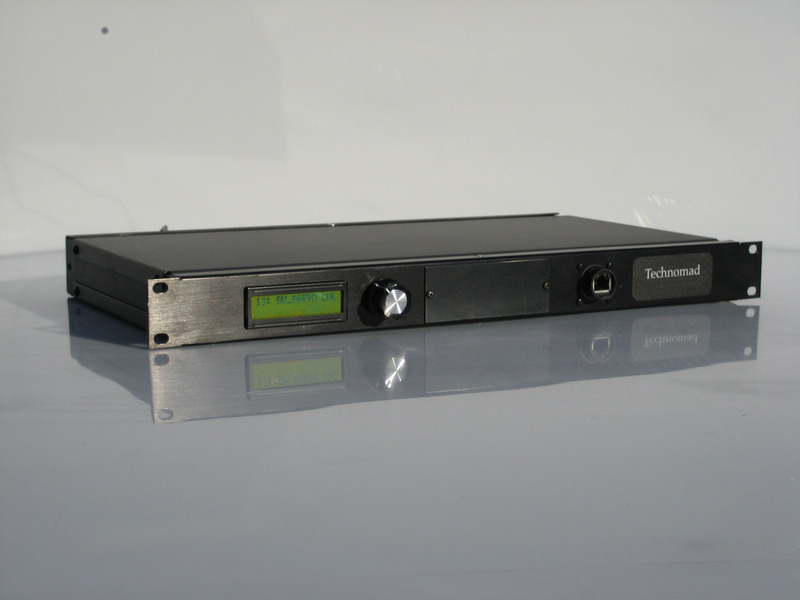 The Schedulon can function as the audio source for a single PA system (in the same way a CD player or iPod can), or it can be used to feed audio to large scale paging / BGM systems in airports or transportation centers.The unit can integrate with a single set of loudspeakers for indoor/outdoor playback of voice, sound effects and background music to a concentrated area, including a specific airport terminal or underground train or subway tunnel; or within a networked PA system to cover entire airports or ground transportation centers. Scheduling can be as straightforward or complex as desired, down to the exact time of day.Airports and transportation centers can connect the Schedulon to existing facility paging systems to broadcast automatic announcements.Operators can also use the Schedulon to record new announcements for instant or future playback via the user-defined schedule.All recording and uploading tasks can also be achieved without the need for a computer or web browser to minimize the risk of crashes and viruses. The Schedulon offers a feature set that makes life easy for the operator.The Local Configuration Mode feature set provides front-panel access to all functions, as well as password protection and management of audio files without the assistance of a computer.Or, an easy-to-use web interface allows rapid configuration of Schedulon functions via any standard browser. Remote control capabilities allow operation of the system from a distance via CGI command, and the Lockout feature ensures that only scheduled or remotely-triggered files can be played when the unit is unsupervised.Users can upload sounds and modify the schedule remotely via web browser as well, greatly simplifying maintenance. The Schedulon is ideal for critical applications — because audio is generated locally by the unit (not streamed over a network), network interruptions will not stop critical sound playback, and network bandwidth is not consumed by streaming audio.Permitted staff can remotely or locally interrupt scheduled playback to play important messages or sound effects as needed.The unit’s internal clock keeps scheduled audio on track even when network time servers aren’t available. The Schedulon can be purchased separately or as part of a Technomad Turnkey PA system, a full range of complete, pre-integrated, fixed or mobile audio solutions featuring Technomad weatherproof loudspeakers, cables, mounting brackets, a dynamic microphone with cable, and a 6RU rack enclosure featuring a two-channel amplifier and a six-channel mixer.Additional rack space allows for inclusion of the Schedulon and other equipment such as power conditioners and limiter/compressors.